Marset FollowMe – table lamps with light "to take away"
Useful in any case – the Marset FollowMe lamp is suitable for every situation. You can take the portable designer light by Inma Bermúdez everywhere you go – just as the name suggests. Due to its mobility and the practical handle, it reminds us of the classic camping light, however, the FollowMe from the Spanish light manufacturer Marset has a much more charming look. The rounded lampshade made from opal polycarbonate opens up seemingly unlimited application opportunities. 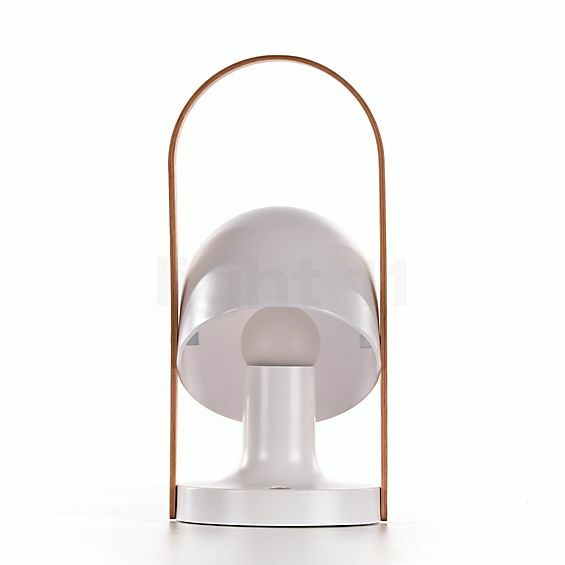 The design of the FollowMe was penned by Inma Bermúdez who created the Table lamps in 2014 for the manufacturer Marset. The Marset FollowMe diffuses soft mood lighting in all directions. The on/off switch also contributes to improving the mood as it allows the luminous intensity to be adjusted in three steps. Since the Marset FollowMe is operated using batteries it does not require any power outlet. When the battery is empty after a period of up to 20 hours, it can be easily recharged by means of the integrated USB port. This table lamp manufactured by Marset may offer such a long service life, thanks to the future-oriented and ecologically responsible LED technology. 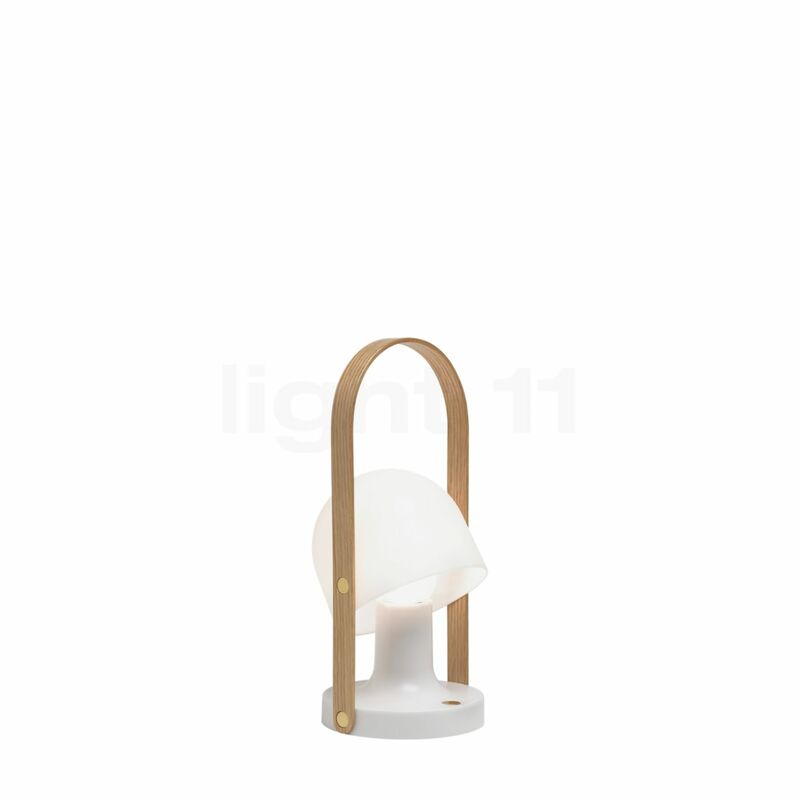 This light with the elegant handle made from oak wood only requires 3.2 watts to generate warm-white light with a luminous flux of 240 lumens – this corresponds to the output of a 25 W incandescent lamp. We bought this light for our cottage by the water as we were completely lost when we tried to use torches in the wind. We charged it and everything looks great. It will have to pass the practical test during the summer but we are very optimistic about that!! We particularly like the design and the different brightness levels!! It is probably also suited to provide for light while you are reading on a garden bench, particularly because the shade does not supply a yucky all-round light but a pleasant light. We really look forward to the wonderful summer evenings that we will spend reading!! Well designed lamp, beautiful object on a outdoor dining table. It lights the table and you can enjoy the stars on the sky. Beautifully crafted, pleasant light. The battery lasts a whole evening. The ideal lamp on a boat, whenever no electricity is available. Tell other customers and us about your experiences with the FollowMe ! Indoors, for instance, the FollowMe can be used as bedside lamp. Here, the table lamp from Marset ensures a smooth transition between daytime and night-time by creating a pleasant atmosphere in the bedroom with its diffuse light that is emitted in all directions. The comforting illumination and the jaunty design also make this table lamp a very popular solution for the children’s room. The decorative Marset FollowMe also cuts a fine figure on the sideboard or the commode in the living room when it effectively highlights the interior. Moreover, it is an ideal choice for a romantic candle light dinner which benefits from the atmospheric lighting created by this luminaire. True to its name, the FollowMe accompanies you even when you leave your own four walls. It serves as cosy oasis of light on your terrace or the balcony providing a great atmosphere for various get-togethers. During a relaxing picnic at a late hour or a stroll on the beach at night the Marset FollowMe table lights also ensure a harmonious illumination.